For a couple of years, I ran multiplayer Kotaku Game Nights in bars and pubs around London and Brighton. We’d play good music with actual DJs, set up a bunch of consoles, get the beers in, and welcome anywhere from 50-200 people, depending on the night. It was the ultimate testing ground for competitive multiplayer. Some games proved too complicated for people to pick up and play in a bar setting; others got boring after a few rounds. The games below are the ones with the best balance of accessibility, nuance and all-important fun for a social setting. The absolute daddy of competitive multiplayer games: I have yet to encounter a person of any age who does not enjoy Mario Kart, and the Switch version is the best ever, with the added bonus of portability and an improved Battle Mode. 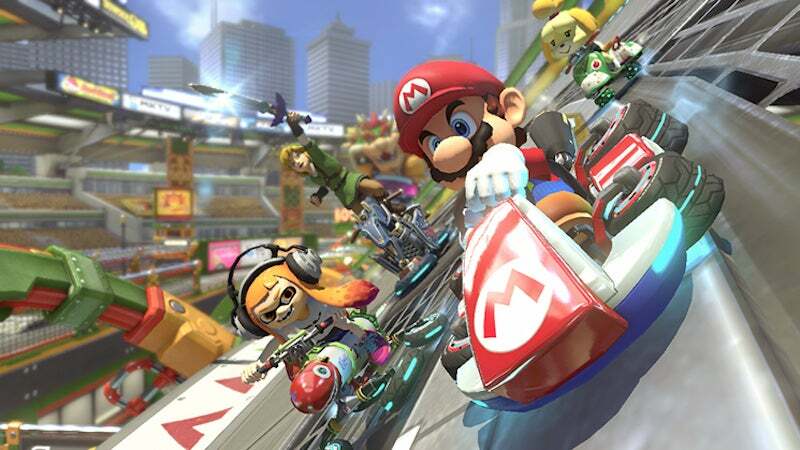 With all tracks and characters unlocked from the start, MK8 Deluxe is geared towards frictionless multiplayer. Take advantage. 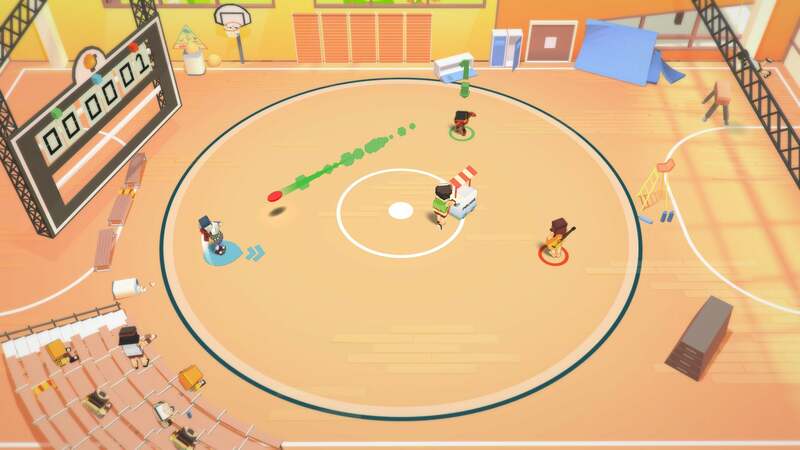 Stikbold is easily summed up as “crazy dodgeball.” The premise seems a little thin—throw balls at each other in themed arenas—but the madcap random events keep it unpredictable and funny. Once a player is eliminated, they can interfere from the sidelines, sending a shark under the beach sand to snap up remaining players or running naked across the playing field. It’s got a neat two-player co-op story mode, too. 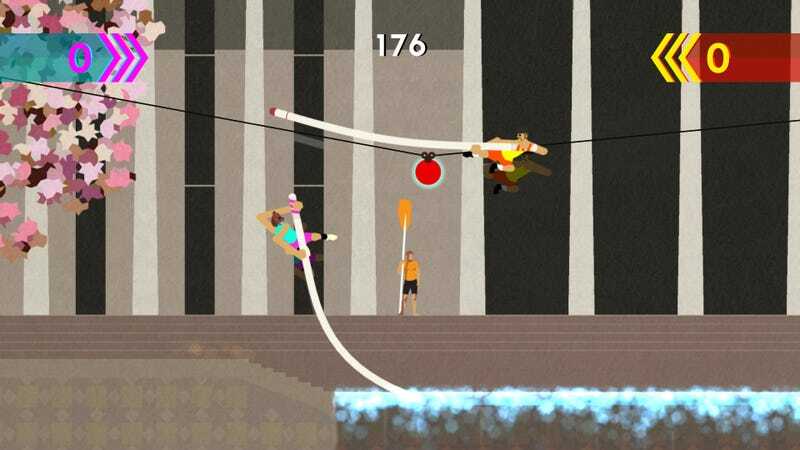 Sportsfriends is a compilation of gently bizarre takes on four different sports. 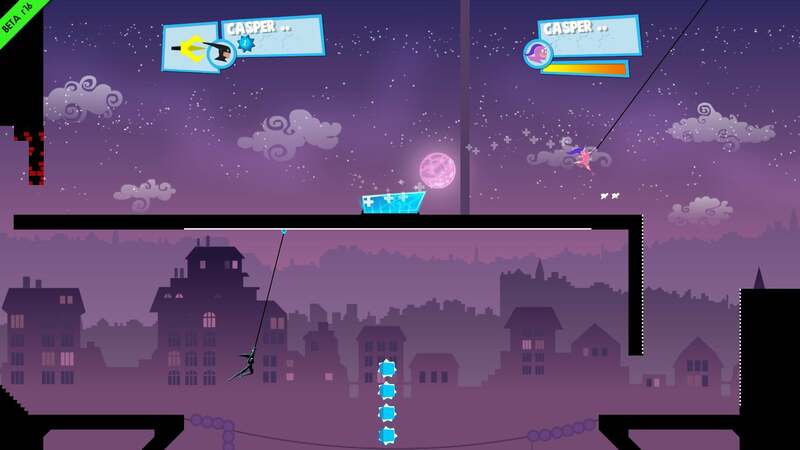 The stars of the bunch are Super Pole Riders, a hilarious competitive version of pole vaulting with a big wibbly pole and a ball attached to a zipline, and Johann Sebastian Joust. Joust uses movement sensors in the controller to create a game where the first person to make a sudden move loses—imagine four players standing with controllers behind their backs, trying to fake each other out. BariBariBall is a more traditional platform/fighting/goal-scoring game that also brings the fun, but is less entertainingly absurd. You and your friends are narwhals in space, and you must pierce each other’s hearts with your horns. The controls feel imprecise at first but offer just the right level of control for unscripted chaos. I used to work with someone who was so improbably good at this game, he must have been an actual space-narwhal in a previous life. 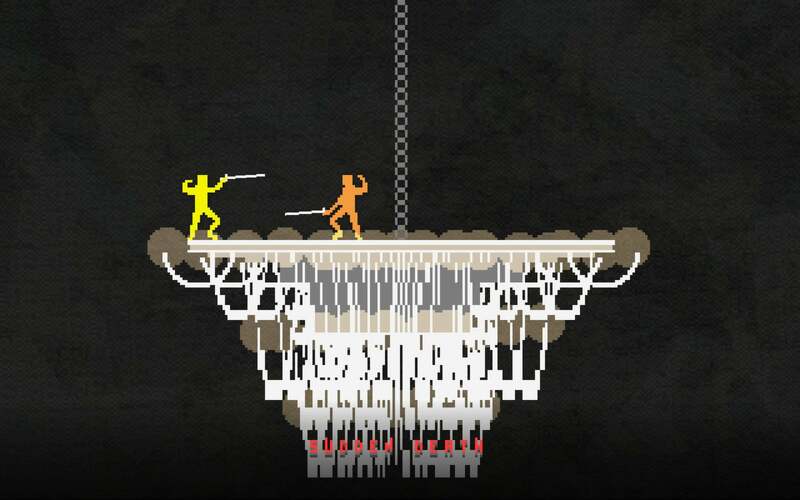 Fencing pixel stick-men pursue each other through surreal landscapes. Nidhogg makes immediate sense as soon as you pick it up: kill your opponent, run away. After a few rounds, once players get a grip on rolling, sword-throwing and flying kicks, it becomes immensely tactical and tense. I’ve seen spur-of-the-moment Nidhogg tournaments draw actual crowds of spectators. The sequel goes with a claymation art style and adds different weapons to the mix, but the simplicity and style of the first is unbeatable in my opinion. If Mario Kart is the daddy of all competitive multiplayer games, Rocket League is the hot new thing. Put this game in a room full of people, and there will never be a controller going spare. “Football with cars” makes instinctive sense, and the longer you play, the more unexpected nuance reveals itself to you. You can start an evening with four novices and end up with a couple of decent competitive teams. 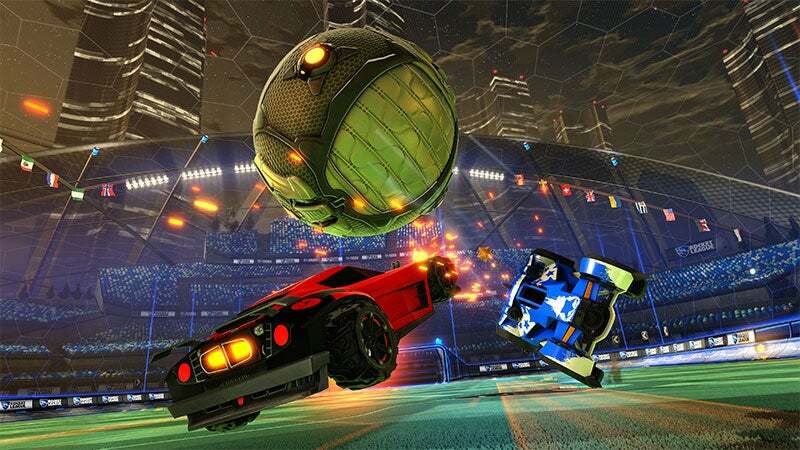 Rocket League’s only weakness is that it’s not as much fun if there’s a big skill differential between players. 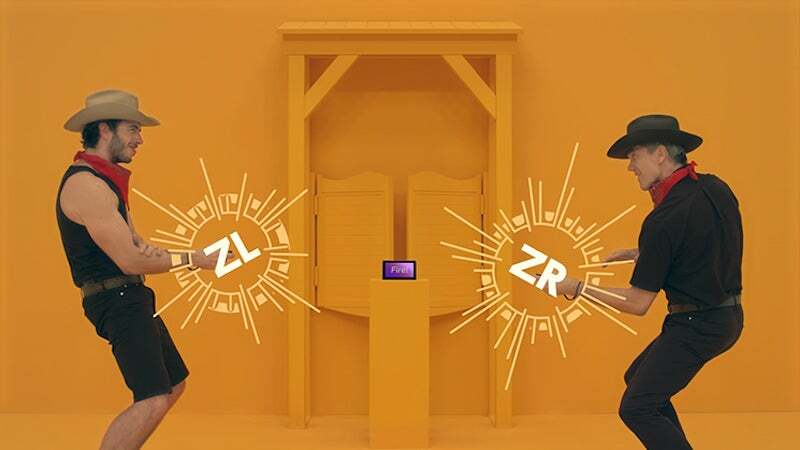 1-2-Switch is a greatly underrated compilation of strange mini-games for the Switch that comes into its own in a room with people of varying gaming experience. Most of the best mini-games are pointlessly locked away until you’ve played for a while, but once you’ve got the full selection to choose from and have spent 10 minutes doing competitive catwalk strutting, you’ll see the light. Not worth full price, though—try to pick it up at a discount. Jelly babies attempt to punch each other to death. 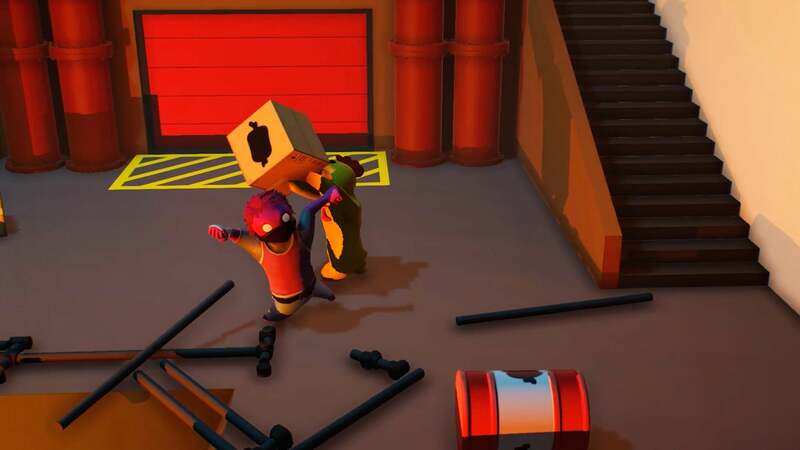 Gang Beasts’ physics are what make this brawler so funny and unpredictable. As the name suggests, players can also gang up on each other if one of them keeps winning, which keeps the playing field even. A total riot. Towerfall: Ascension is a pixel-art battle platformer with bows and arrows. It’s an exceptional competitive game, fast but not overwhelming. Matches can turn in a matter of seconds, it looks and sounds awesome, and it has slow-mo victory replays. It also has that elusive “one-more-go” factor in abundance. Smash Bros is not the only accessible-yet-complex platform brawler around any more— Brawlhalla is another, increasingly popular take on the theme—but it is the best one. 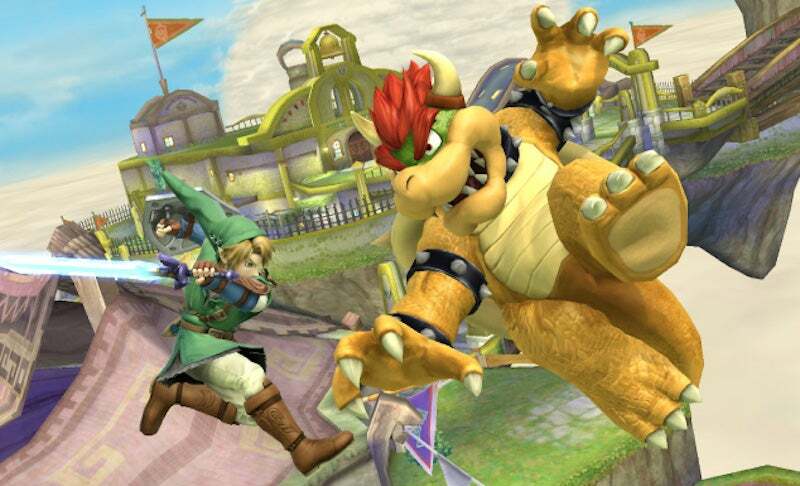 The star factor of Nintendo’s roster is an undeniable draw, and unless one of your party is a Smash master, switching up characters and stages usually keeps one player from dominating. It’s not one for groups where not everyone plays a lot of games, though. I’m betting on a Switch re-release of this in the not-too-distant future. 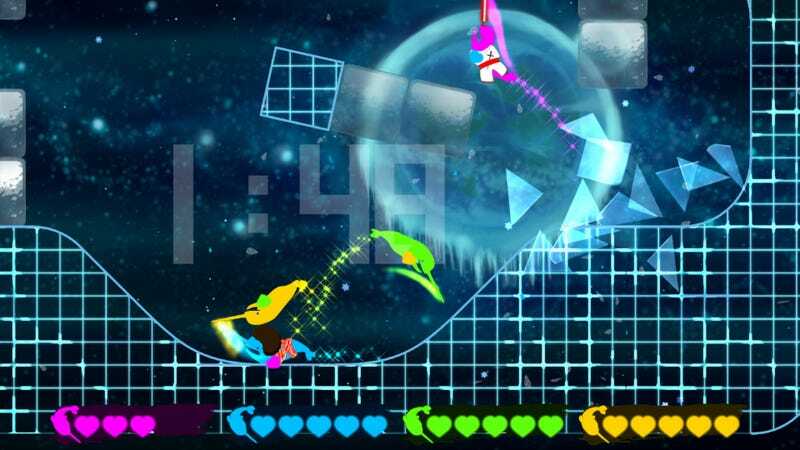 Four players race through a level with grapple hooks. As matches last longer, the screen gets smaller, upping the pressure. Speedrunners is beloved by ear-splitting juvenile YouTubers, but don’t let that put you off. 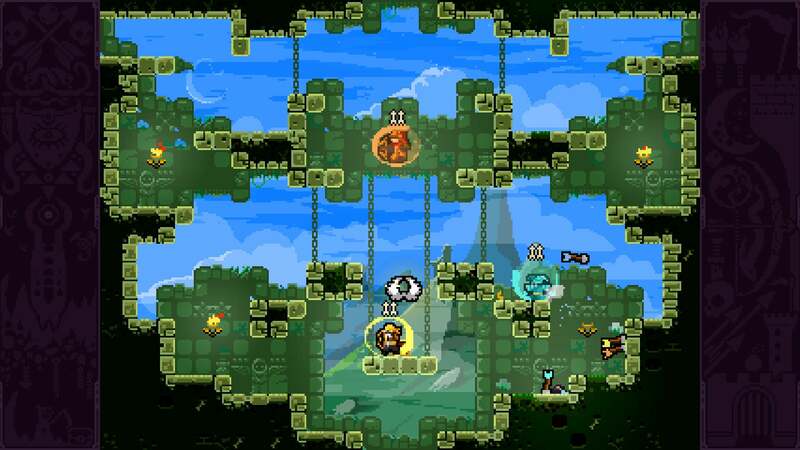 It will have you cursing both your friends and your own momentary lapses of platforming skill. If baseball were a fighting game, it would be this. 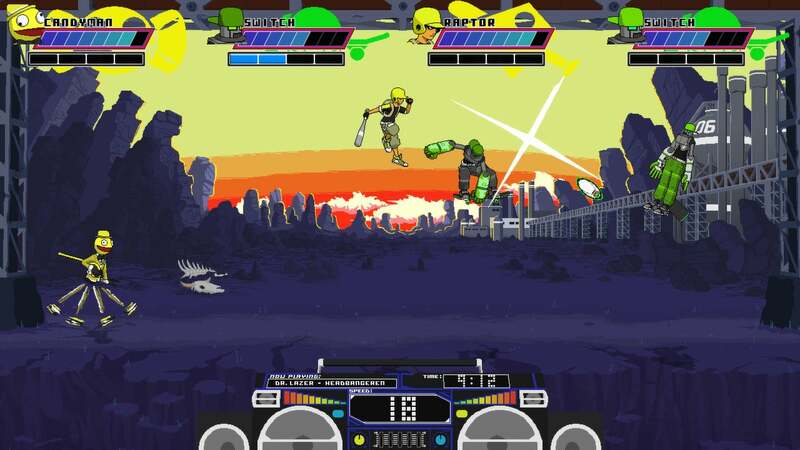 Fighters attack not each other, but a bouncing ball that gets faster and faster as it ricochets around the level. The slightest lapse in concentration will doom you. It’s absurdly tense and has awesome music. 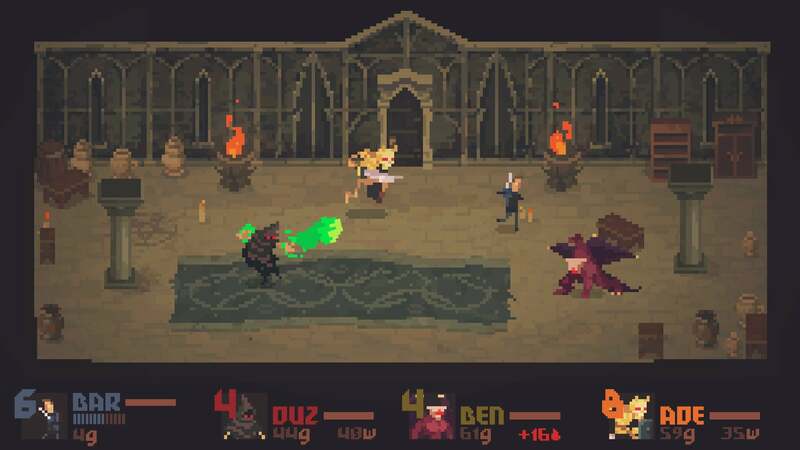 At the beginning of this dungeon-crawler, you fight your friends to death. The victor gets to delve further into the dungeon, whilst the losers control the monsters, traps and bosses trying to kill them. If you get the last hit on the hero player, you get to take over. Crawl is truly brilliant with four players, and never boring for a moment.